A reliable source for recession forecasting is the unemployment rate, which can provide signals for the beginnings and ends of recessions. The unemployment rate model (article link), updated with the May figure of 5%, does not signal a recession now. The 8-month smoothed annualized growth rate of the UER (UERg). Referring to the chart below, and looking at the end portion of it, one can see that none of the conditions for a recession start are currently present. The UER was in a process of forming a trough, the short EMA remains below its long EMA – the blue and red graphs, respectively, the spread widened to minus 0.29% (last month minus 0.21%). UERg has formed a trough in 2015, but still at a low level of minus 9.48% (last month 9.28%) – the green graph. Also the 19-week rate of change of the UER is now at minus 4% (last month 0%), well below the critical level of plus 8% – the black graph. For a recession signal, the short EMA of the UER would have to form a trough and then cross its long EMA to the upside. Alternatively, the UERg graph would have to turn upwards and rise above zero, or the 19-week rate of change of the UER would have to be above 8%. 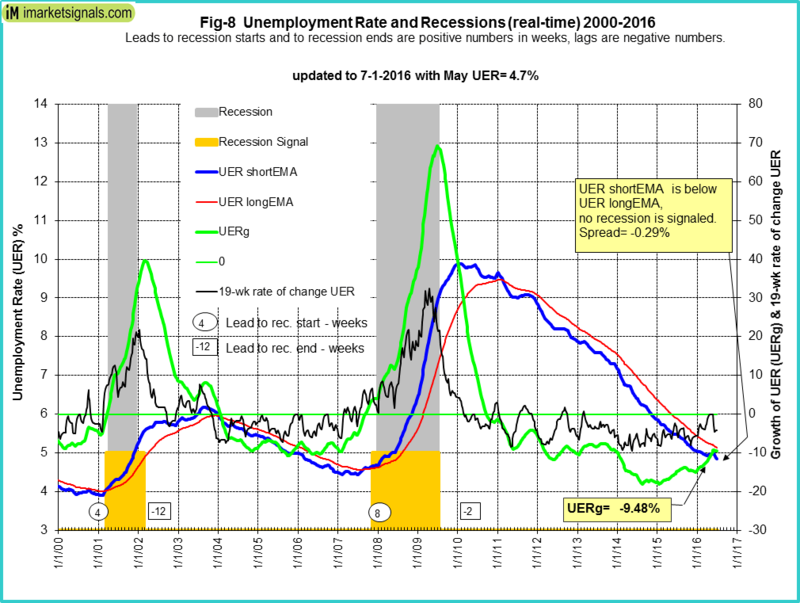 Currently the trajectories of the unemployment rate’s short- and long EMA are still downwards – none having a positive slope, UERg is far below zero, and the 19-week rate of change of the UER is also way below the critical level. Based on the historic patterns of the unemployment rate indicators prior to recessions one can reasonably conclude that the U.S. economy is not likely to go into recession anytime soon.